Walk through Duluth’s dark history and explore the local legends that might otherwise fade into history - true stories of gunfights, murders, hauntings, ghost ships, and shipwrecks! 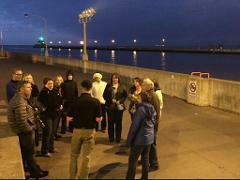 The Dark History Walking Tour shines the light on Duluth's dark and nearly forgotten past. You'll make your way through Canal Park and Downtown Duluth - learning about shipwrecks, gunfights, murders, and reported hauntings along the way. Duluth has a rich history and we're excited to show you a side of Duluth that you won't see anywhere else! *Note: This isn't a hokey, haunted-house tour with folks dressed up like goblins and ghouls. Duluth's dark history is scary enough on its own! The Dark History Bus Tour shines the light on Duluth’s dark history – stories of gunfights, murders, riots, and even some of the local haunting legends that might be otherwise fade into the past. 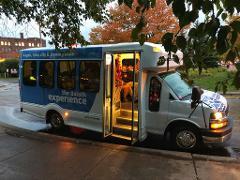 The Dark History Bus Tour shines the light on tragic stories from Duluth's dark history and some of the reported hauntings that might otherwise fade into the past. Duluth has a rich history and we're excited to show you a side of Duluth that you won't see anywhere else! This isn't a hokey, haunted-house tour with folks dressed up like goblins and ghouls. Duluth's dark history is creepy - and interesting - enough on its own! *Please note that only guests 21 years of age or older will be able to enjoy craft beer samples. Current and valid ID required.